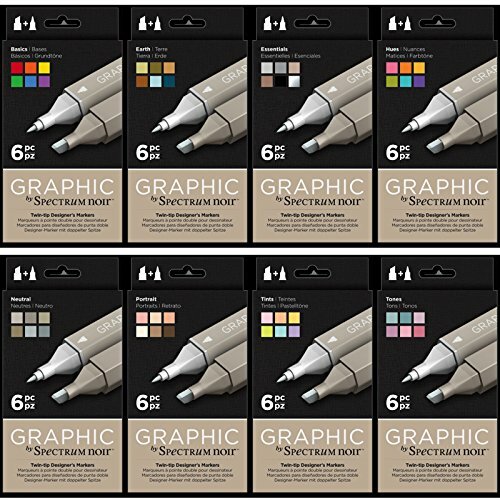 The Graphic range shares the same colour chart as the original Spectrum Noir alcohol markers, whilst offering an entirely new and exclusive nib combination. Full 48pc system included. When the Graphic pen is held at its widest point, it gives a loose, sweeping feel that's ideally suited to rough layouts and board colour-fills. When used sideways on, it provides a firm, precise grip when working in fine detail. Perfect for existing Spectrum Noir users who want to develop their skills, as well as appealing to new customers with the growing art and colouring category. Special offer below recommended $ RRP. If you have any questions about this product by Spectrum Noir, contact us by completing and submitting the form below. If you are looking for a specif part number, please include it with your message.